Understand where migrants come from, where they settle, and why. A family walks through a field at a makeshift camp for migrants and refugees at the Greek-Macedonian border near the village of Idomeni, Greece, April 4, 2016. More than 250 million people—roughly one out of every thirty people on earth—currently live in a country in which they were not born.1 With more people than ever on the move, it’s important to understand what drives migration because it’s increasingly likely that people will encounter—or become—migrants in their lifetime. People move for lots of reasons, which are often called push and pull factors. Some people are pushed to leave their countries because of conflict, natural disasters, or persecution. The majority, however, are pulled to countries that offer better economic prospects for themselves or their families. It’s quite common that a mix of push and pull factors affects a person’s decision to migrate. In the past thirty years, the number of international migrants rose by nearly 70 percent. Source: United Nations, Trends in International Migrant Stock: The 2017 Revision. In 1990, migrants represented 2.88 percent of the global population. Since 2005, the number of international migrants has shot up. In 2000, that percentage fell slightly to 2.82 percent, but in 2017, it rose again to 3.41 percent. While the difference is only about half a percentage point, the global population has exploded during that time. While much of this increase can be simply attributed to the growth of the global population in general, major, enduring conflicts such as the Syrian civil war have also contributed to the rising numbers of migrants in the twenty-first century. About one-third of all international migrants come from just ten countries. India is the top country of origin for migrants, with more than sixteen million Indian-born people living in foreign countries. Although Indian migrants are the largest group coming from a single country, they represent only 1 percent of India’s total population. Small countries tend to be more dramatically affected by push and pull factors causing migration. In Bosnia and Herzegovina, violent conflict during the 1990s and lingering instability in the region since then has pushed much of the population abroad: today, around 50 percent of the 3.5 million people born in Bosnia and Herzegovina live elsewhere. Similarly, job opportunities and other factors have pulled around 10 percent of the Philippine population abroad. Emigrations of that size have profoundly affected the economies of these countries. Half of all migrants live in just ten countries. In 2017, high-income nations1 hosted 64 percent of international migrants. That’s not surprising considering that a vast majority of the world’s international migrants are economic migrants who have voluntarily left their countries for better economic opportunities elsewhere. Most refugees and asylum seekers, who make up 10 percent of the world’s international migrants, reside in low- or middle-income countries near those that they left. However, as we’ll see below, most asylum seekers ultimately apply for asylum in higher-income countries for similar economic reasons. Among these nations, one stands out as the top destination for international migrants: nearly one-fifth of all international migrants currently reside in the United States. 1. "High-income nation" is a designation granted by the United Nations based on per capita GNI, or gross national income. View the full list here: http://www.un.org/en/development/desa/policy/wesp/wesp_current/2014wesp…. Where people migrate depends on what’s happening in the world. The countries that host large numbers of migrants change in response to the same push and pull factors that lead to migration: economic and political developments, as well as conflict, persecution, natural disasters, and other crises. From 2010 to 2017, the three largest paths of migration flow between two countries (also called bilateral corridors) consisted of refugee movements, fueled largely by the civil war in Syria. This is a change from previous decades, when the largest migration corridors consisted mainly of economic migrants looking for better work opportunities abroad. For example, while the single largest migration path used to be of Mexicans coming to the United States primarily for better economic opportunity, now it is Syrians displaced by conflict fleeing to Turkey. Source: UNHCR Global Trends: Forced Displacement in 2017. The world’s refugee population is at a record high. The UN High Commissioner for Refugees (UNHCR) estimates that twenty-four people are displaced every minute. Their origins and destinations are dominated by just a few countries. For example, more than half of all refugees come from only three countries: Syria, Afghanistan, and South Sudan—all countries involved in protracted conflicts. For the most part, refugees end up in countries near those that they fled. Low- and middle-income countries are home to approximately 85 percent of the world’s refugees and asylum seekers. For example, as a result of the civil war in Syria, neighboring Turkey currently hosts the world’s largest refugee population of 3.5 million refugees. Sometimes these refugees live in temporary refugee camps run by host governments or the UNHCR; often they strike out on their own. Although more than 90 percent of these refugees do not live in camps and often reside in urban areas, the 10 percent who do still make up a big number: for example, 230,000 refugees live in two dozen Turkish-run camps in which shelter, food, and other services are available. UNHCR advises and supports the Turkish government’s refugee assistance operations by verifying the information Syrian refugees provide, giving money and supplies to those in need, and running schools for refugee children. High-income countries receive the most asylum claims from refugees. 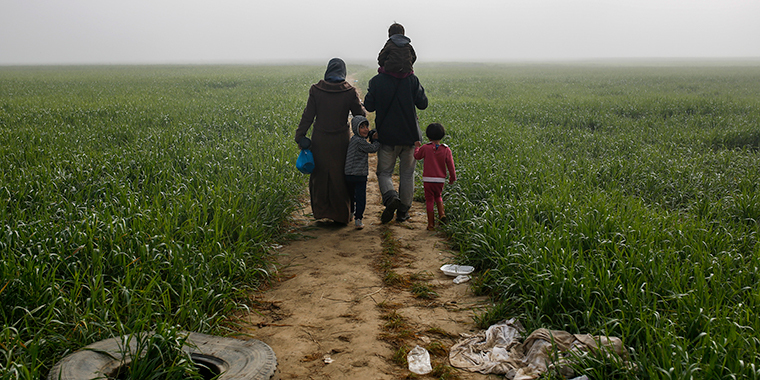 Although a majority of refugees and asylum seekers live in neighboring low- and middle-income countries, most refugees ultimately request asylum in high-income countries, which offer better economic prospects. Among those, Germany received the most individual asylum applications of any country in 2015 and 2016, but the United States surpassed Germany in 2017, receiving 331,659 claims. * Cases are multiplied by the average number of person per case. Migration today shapes tomorrow’s world. Migration—who migrates, where, and why—is constantly evolving. Today’s migration patterns can tell a lot about the broader global context, from economic opportunities to humanitarian crises. But they also give a preview of what the future will look like in a world shaped by the paths of migrants.